Are you an avid CraigsList.org user? TOO LATE when viewing the posting? 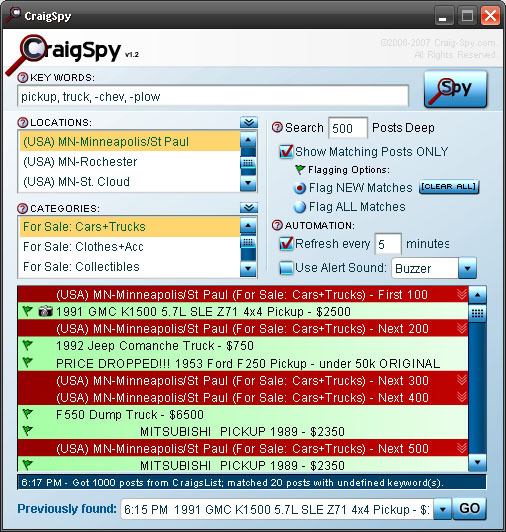 CraigSpy is the ultimate CraigsList monitoring solution! BE FIRST IN LINE, EVERY TIME! it will alert you of these new posts immediately! This tool is great for watching for those hard-to-find items! But, with CraigSpy, you will greatly increase your chances of being the first person in line! In addition, the simple user interface will allow you to quickly browse postings and photos! Never miss another FREE item! Watch for the BEST deals! Find the job of your DREAMS! Lease or buy the home you WANT! The CraigSpy software IS 100% SPYWARE, ADWARE AND VIRUS FREE! We respect your privacy and do not promote bad 'netiquette to anyone. CraigsList.org is copyrighted property of CraigsList, Inc.
Craig-Spy.com is in no way affiliated with CragisList.org or CraigsList, Inc.